Whether you’re looking to monitor a residential setting for outsiders or keep an eye on your employees for suspicious activities or protect you private property from intruders, there is all kinds of security cameras for all your needs. The professional security camera is mainly classified into two main types, CCTV Cameras and IP Security Cameras. The terms camera comes from the Latin camera obscura, which means “dark room”. Surveillance cameras have come a long way since CCTV systems used pure analog surveillance cameras that used to connect to a VCR for recording videos. Now the cameras use fully digital network based security systems that come with extra security measures. Many new devices such as wireless transmitters, IP cameras, web cameras, camera servers, and NVRs are being added to the network of camera systems which comes as great resources to use in the security industry. The phrase closed-circuit television refers to a self-contained surveillance system, commonly abbreviated as CCTV, which transmits a direct feed of its connected security cameras to a receiving station or DVR (Digital Video Recorder) via coaxial or UTP cabling. It uses traditional radio frequency (RF) technology rather than photographic technology, proving an efficient and cost-effective means of video surveillance. The system relies on strategic placement of cameras for transmitting video feed to a limited set of monitors which may operate on an “as-needed” basis. Security cameras typically work in conjunction with security systems, whether it’s for home security or monitoring any private property or store setting. Security cameras are video cameras that are used for the sole purpose of monitoring an area. They are often installed in public places to protect the general public by deterring any criminal activity or act as a material evidence in case a crime has been caught on camera. The professional security camera is mainly classified into CCTV cameras and IP cameras. They are a key component in home security solutions and come in a wide range of form factors with a multitude of features. The phrase closed-circuit television video system is commonly abbreviated as CCTV. The term “closed-circuit” refers to a self-contained system in which the signals can only be accessed by equipment within the system. This is in contrast to the conventional broadcast television where the signals can be accessed by anyone with the receiving equipment. Security cameras are basically closed-circuit cameras that transmit audio and video signal to a wireless receiver where it can be viewed and recorded. The security cameras typically work in conjunction with security systems, whether it’s for home security or monitoring any private property or store setting. 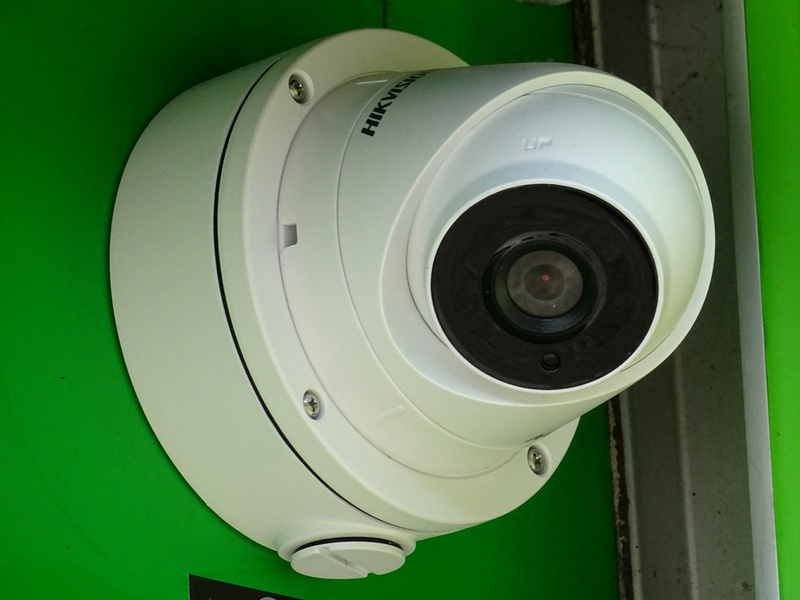 CCTV is a surveillance system that transmits a direct video feed of its connected security cameras by a direct connection to the receiving equipment such as a monitor. This connection is typically made with coaxial cable but fiber-optic cable or a single twisted-pair cable can also be used. This whole network of security cameras make up the closed-circuit system which cannot be viewed from outside of the system. Other modern camera systems such as security or surveillance cameras are not always true closed-circuit systems, although they are usually referred to as such. They play equally important roles in the areas of monitoring and control. Unlike CCTV cameras, security cameras transmit video feed as a digital stream of data to a NVR (Network Video Recorder) via a single cable installation with PoE (Power over Ethernet) which literally eliminates the need of power cables because it receives power from the cable itself. -Additionally, the videos are stored digitally rather than physically. CCTV cameras, on the other hand, rely on strategic placement of cameras to transmit video feed to a limited set of monitors which may operate on an “as-needed” basis. However, cameras are to be placed in a single location because cabling is required. CCTVs are used in conjunction with intrusion-detection devices for the purpose of asset protection. It’s a reliable, cost-effective means for improving security and safety. The use of CCTV systems is widely accepted in both public and industrial facilities for managing security. 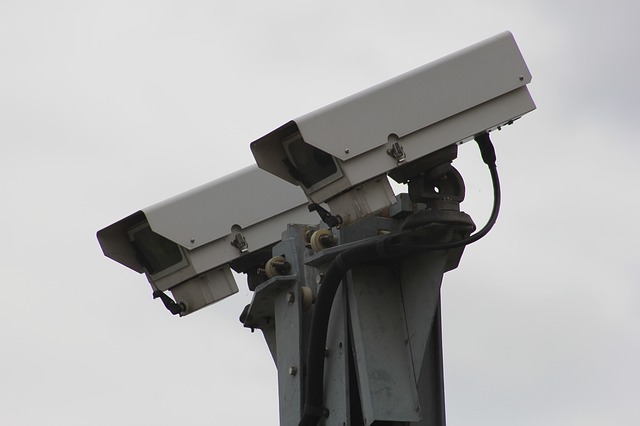 The main objective of a CCTV system is increased deterrence through security. Security cameras are equally important, especially when it comes to security and surveillance. For example, motorway camera systems are used for monitoring and managing the flow of traffic and thus control situations. They are used in all kinds of setting from business to personal. Security and surveillance cameras come in a wide variety of form factors and designs for all your security needs. For example, traffic cams are used to monitor and manage the flow of traffic throughout. CCTV is often seen as a security tool which plays equally important roles in areas of monitoring and control. It has become an invaluable tool for organizations involved in anything to do with security, traffic control, crowd control, etc. The objective remains the same – to deliver 24/7 video security solution for every security need. Whether it’s for home security solution or building a surveillance system for any private setting, you can always choose what’s best for your needs. Sagar Khillar. "Difference Between CCTV and Security Camera." DifferenceBetween.net. 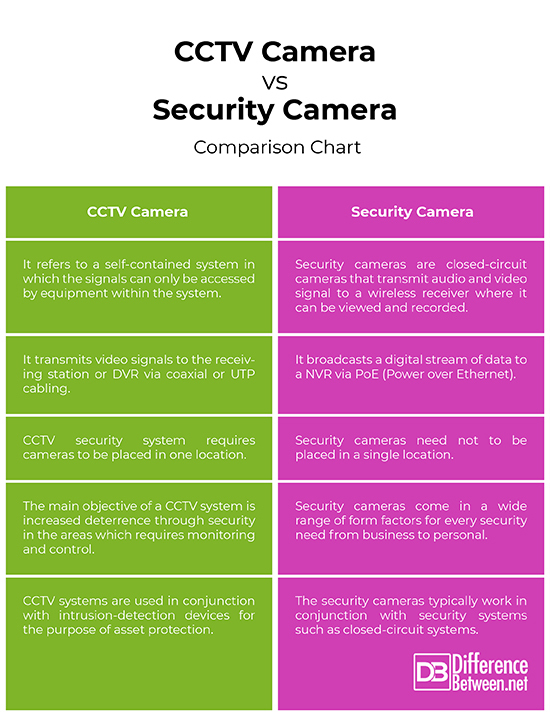 September 18, 2018 < http://www.differencebetween.net/technology/difference-between-cctv-and-security-camera/ >.